Stop by Buffalo CycleBoat's Facebook page to enter to win 6 Free Seats for 2018! WOW it’s our ONE Year Anniversary here at BuffaloCycleBoats and to celebrate we are giving away 6 seats on our first cruise this summer! Step 1. Like the post on Facebook (click here to view post). Step 2. Tag 5 friends in the comment section of this post that you'd bring aboard. Step 3. Share this post. It's that easy! The winner and their 5 friends will be randomly selected and announced on Saturday, February 17th at 5:00pm! Winner will get a 6-pack of seats aboard our 1st cruise of the year on May 26th! Want to lock in your date now? 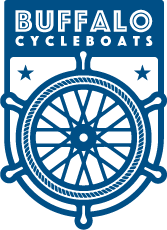 Click the “Book Now” button on the header of BuffaloCycleBoats.com to book your cruise today. Cheers! Date Night On The Buffalo Waterfront!